Many of you may wrinkle your nose as you think of childhood memories of swallowing a spoonful of castor oil to cure your ailment. Its strong taste mirrors its cleansing strength as a medicinal product. There are a number of castor oil benefits that have been discovered and passed on over the years. We will discuss these as well as any possible castor oil side effects to give you the information you need to decide whether castor oil is right for you. So, what is castor oil? Basically, it is an oil extracted from the seeds of the castor plant. Centuries ago, it was used as a poison to kill people as it contains toxic, germicidal, disinfectant, and purgative properties. Even with a low-dose intake, one can experience vomiting and diarrhea. This is where the oil’s medicinal uses come in as it has been thought to help combat colds, coughs, fevers, indigestion, and skin disorders. Because it induces vomiting, it has been a primary treatment method for accidental poison ingestion and invaders such as tapeworms and roundworms. The purported castor oil benefits stem from the belief that the castor plant targets the stomach. It is used mainly for illnesses or ailments that begin in the stomach. Castor oil is used as a topical treatment for the conditions of rheumatism, gout, and arthritis. It contains fatty acids such as linoleic acid, oleic acid, and ricinoleic acid. It is also combined with medicines to create a powerful treatment. The ricinoleic acid in castor oil may also work as a natural pain reliever during menstruation. It targets issues that may hinder the flow process. Castor oil may help clear rashes and redness caused by fungal or bacterial infections when used as a topical treatment. The oil’s powerful undecylenic acid has germicidal and disinfectant properties. Its natural antifungal, antibacterial, and anti-microorganism properties make castor oil for acne and other skin problems a viable solution. Castor oil has been used for years as a purgative tool, and this includes using it as a laxative. Low dosages are recommended when using castor oil for constipation. Castor oil may work as a natural booster for the production and flow of breast milk. The fatty acids in castor oil could increase the quantity of milk. It is recommended to use low dosages of any cold-compressed form of castor oil. The common hair problems of dryness and hair loss may be rectified with the use of castor oil, which has fungicidal, insecticidal, and germicidal properties. It has ricin and ricinoleic acid that defend against infections of the scalp and hair follicles. Castor oil for hair issues can also moisturize the scalp. Castor oil benefits may include boosting the functioning of the immune system by improving blood circulation, lymphatic drainage, and the overall health of the thymus gland. By helping these functions, it has a direct effect on the digestive and circulatory systems. Castor oil helps promote good blood circulation, which in turn boosts the immune system. It also detoxes our systems. As a natural cleanser, castor oil promotes hormone production since it gets rid of toxins. This balances the hormones, which in turn promotes good blood flow. Healthy circulation could help to prevent symptoms of PMS such as mood swings, depression, and fatigue. Traditionally, when women have had difficulty with childbirth, they have been given castor oil to induce labor. The ricinoleic acid reportedly stimulates the EP3 prostanoid receptors within the uterus to speed up contractions. Are There Any Side Effects of Using Castor Oil? While there are many castor oil benefits, precautions must be taken when consuming the natural remedy. The same oil that may help heal ailments was once used as a dangerous substance in great quantities. To help you sort through the risks, we have broken down the possible side effects of using castor oil. For some, the use of castor oil can be detrimental to the stomach. The ricinoleic acid in the oil may stimulate gastrointestinal issues that cause nausea. While castor oil is a primary natural laxative for severe constipation, it may cause severe diarrhea in some cases. Another counteractive effect of castor oil may be skin rashes caused by an allergic reaction. Before using the oil as a topical treatment for skin disorders, it is advisable to test it out on a small patch of skin. One of the side effects of castor oil is cramping of the abdominal muscles. This may happen even when the oil helps with other abdominal issues. Use of castor oil in high dosages may cause dizziness or light-headedness. 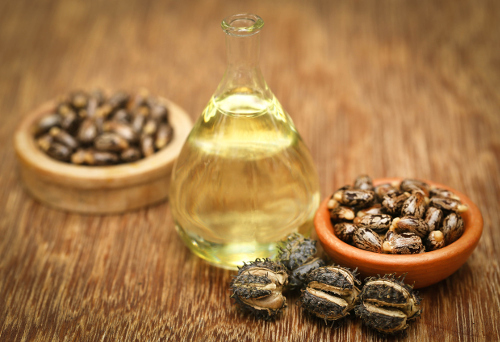 “8 Amazing Benefits of Castor Seed Oil,” Organic Facts; https://www.organicfacts.net/health-benefits/seed-and-nut/health-benefits-of-castor-seed-oil.html, last accessed May 11, 2017. Chaudhary, M., “Unexpected Side Effects of Castor Oil You Were Not Aware Of,” Only My Health, March 10, 2016; http://www.onlymyhealth.com/health-slideshow/unexpected-side-effects-of-castor-oil-you-were-not-aware-of-1457607809.html, last accessed May 11, 2017.